Churro (plural Churros) is a deep fried dough pastry that has been gaining a lot of popularity in Malaysia lately. Its origin country is unclear (according to Wikipedia) but personally, I first found out about this delicious snack from a Korean TV show a few years back. Being a total food lover, of course, it made me want to try it. Unfortunately, it was pretty hard to find a decent cafe/stall that sells it at an affordable price (basing on my poor university student status) in Malaysia at that time. In the end, I sort of just give up looking for it. Time passed and the Hallyu wave grows bigger. After awhile, I started to see a lot of popular Korean food franchises that I've only seen on TV before announcing their arrival in Malaysia. Guess how ecstatic I was at that time? That's when I started to see some churros stalls popping up in shopping malls and I finally get to try the Churros I've been craving for. 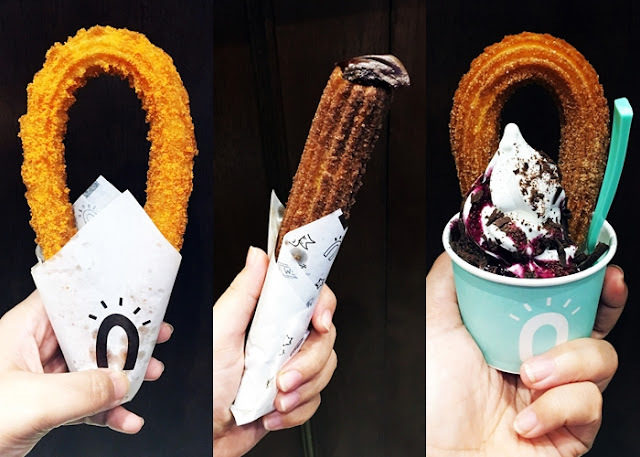 Fast forward to early this year, I received an invitation email from Street Churros to attend a review session at their latest branch in Berjaya Times Square, KL. At first, I was a little sceptical. After the previous letdown, I was considering hard if I should accept the invitation especially since food review requires a lot of time on my side. After a bit of thinking, I decided to give the snack one last chance (drama queen line part 2) and guess what? I ended up giving myself a pat on the back for that decision. Turns out, the two failures does not predetermine the third result. 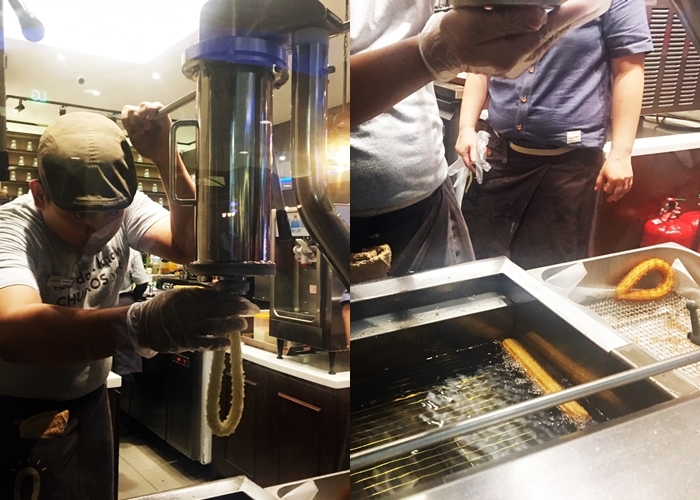 When Street Churros CEO mentioned how big the churros craze in Korea, he is not spitting nonsense. Good gracious, they are really good. I was totally blown away! (drama queen line part 3). 1. Churros | Back to basic kind. You can choose the coating and dipping sauce that you'd like. 2. Filling Churros | Easy to munch. Choose the filling & eat it even when you're on the go. 3. Ice Cream Churros | Double the happiness. Pick your preferred flavour & dip in like there's no tomorrow. The basic churros (RM4.90) offers three types of coatings; chocolate, cinnamon and cheese. You can also add-on your preferred dipping sauce (RM1.50/each) to elevate your churros experience. Available in chocolate, cream cheese, butterscotch and blueberry. My personal favourite would be the Cinnamon Churros dipped in Butterscotch sauce; sugar rush at its best! Moving on to the filling churros (RM7.90), I would say the Cream Cheese is right on my snack alley. I just love how it complements the churros and the fact that the fried pastry does not get soggy even with the sauce inside for more than five minutes. I wish my stomach had more space that day so I can try the Chocolate & Custard fillings too. I guess, now I have a good excuse to come back to Street Churros! The highlight of my Street Churros experience would be the Ice Cream Churros! I am currently in love with the Churros dipped in their plain ice-cream set (RM7.90). The ice-cream is so so so good I can't stop raving about it. It kinda reminds me of those Korean milk ice-creams that are really good but kind of pricey. Do you think that's all? Street Churros also offer a pretty wide range of beverages from coffee beverages, non-coffee beverages, shakes (RM9.90) and fruit ade(s) (RM7.90). My personal recommendation would be the O'My Coconut shake and Korean Citron (Yuja) Ade. Like I mentioned above, I was too full to finish everything that I ordered so I ended up bring the leftovers home. Surprisingly, after more than 30 minutes the churros stayed fresh and crispy as if it just comes out of the kitchen. I was not expecting it at all since the churros I've bought in another place before ended up being too soggy and mushy to eat. How I felt about churros previously is totally gone, and have now turned into a new obsession. To be honest, I've started to crave for freshly made churros from Street Churros again since I am writing this blog post. Seriously, the biggest downside of writing about food. LOL! I guess, this calls for another churros-date soon. Thanks again to Street Churros Malaysia for inviting me! If you are interested in trying them, make sure to check out Street Churros Facebook StreetChurrosMY and Instagram page @streetchurrosmy for more info. *This is a sponsored post but all the opinion in this blog post comes from my personal view.